First, as I had written on day 4, our understanding of public interest should aspire to enhance, explore and/or contribute towards achieving and understanding our overall potential capability and well being as a people. Second, a key towards pursuing that objective is to understand and appreciate the many paradoxes of our behaviors, attitudes, and characterizations of actions that can be paired on a dimensional scale with singular interests being served on one end and public or broader interest on the other. Regressive versus progressive is another way I like to describe the opposing poles on such a continuum. Third, the behaviors and attitudes on the single interest/regressive side of the continuum is more certain and defined, in fashion with the “cogito ergo sum” (I think therefore I am) certainty I talked about in my Day 8 post. Fourth, like I also said in that post, the degree of uncertainty rises as the group size involved rises. Therefore, for this model, the public /braoader interest side of the dimensional scale also gets more difficult in terms of certainty as the size increases for the group whose interests you attempt to cover. 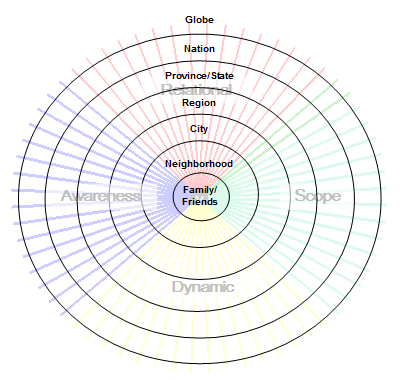 Fifth, an observation, that the scale and degree that the public or broader interest is served for a defined group size, at least in a fair and mutually beneficially way, depends on these behaviors and attitudes being balanced on these continuums at a level appropriate for the group size involved. The probability that such a group can attain such a potential declines depending on the number and degree of imbalances held by members of that group. This is where the graphic comes in. Mentioned in the Day V post that each line represents a continuum of paired paradoxal behaviors/attitudes. The square in the middle is the singular-interest. The more you fall back to the centre, the fewer interests that are being positively served, eventually going down to one (could even be zero). To this, I add circles radiating outward that represent a growing size of public interest whose coverage depends on the categorization and definition of the group involved. In this case, a simple Canada/US point of view going outwards geographically. A quick and rough application of the latter part of that quote to my model produced the graphic at the beginning of this post representing a “stupid one”. Treating confidence as fitting a doubt versus certainty continuum gives the long bold blue line to the lower left with overconfidence being treated as a case of misplaced Certainty. 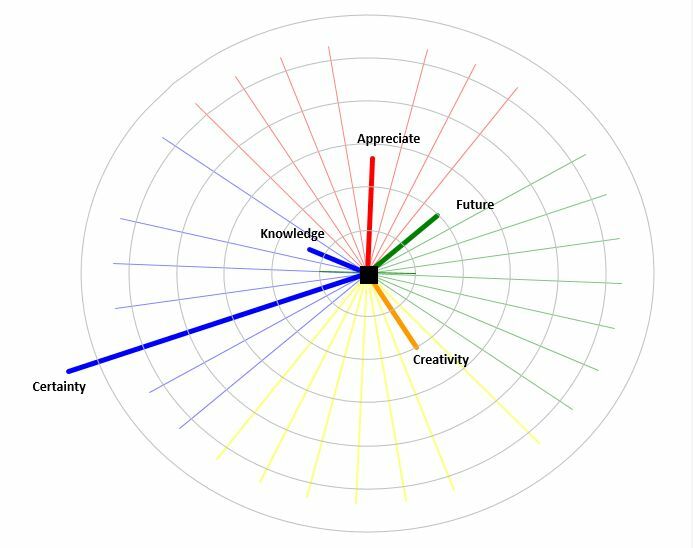 Recall also, as the blog name says, and my first NaBloPoMo post, I work with Four Dimension categories – Relational (red), Scope (green), Awareness (blue), and Dynamic (yellow). I’ve placed Certainty in the Awareness category as I did Knowledge as a measure of intelligence which, since the quote involves stupidity, is a short line. However, stupidity can involve many things like a lack of Appreciation of others, a non-Future short term outlook, or just a lack of Creativity. What the 4DF graphic is meant to depict here is how any one of those four regressive measures of stupidity can deter the potential of the public interest, but even more so when paired with an overly progressive one resulting in quite an imbalance. This also demonstrates how an otherwise progressive trait, Certainty, can be an asset or a liability to the broader interest.